Regular reader Mango-Man sent in a picture of a bacon sandwich. It’s not one he made, but it looks intriguing. There is definitely plenty of bacon! But it still seems to be lacking something. What do you think should be done to make this bacon sandwich better? LOTS of cheese and mayo and maybe even some ketchup! Oh, and the bread should be toasted on a buttery griddle, that would be good too. And lose the Wild Turkey and go with milk instead. And I think Miracle Whip would make it considerably better, which would add a tangyness to it and keep it from being too dry. Shouldn’t bacon be served on a stick? I demand an explaination! Does this sandwich fit into Important Doctor’s “all-you-can-eat” 80/20 diet?? The Sammich looks big enough for 2 people with a little left over for breakfast. 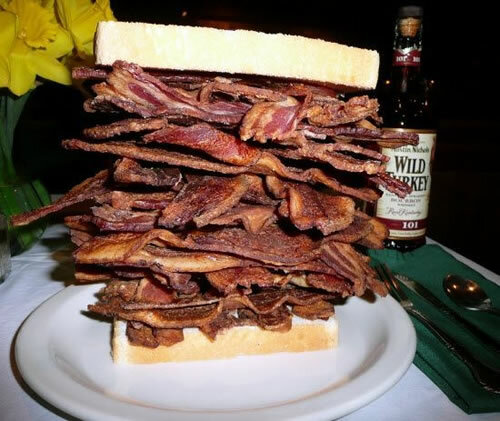 Can anyone share what’s the name and address of the restaurant that makes this bacon sandwich? I have no idea. That information did not accompany the picture when I found it. But you could always make your own sandwich like that — it doesn’t look too difficult… and you could implement some of the improvements we suggested. Actually, that would be cool if someone did remake one of these Food Critic dishes with the improvements and sent us a picture. We’d post it on the blog.